Video footage with the kind permission of tbobborap1 - highlights from the 2018 event. Scale models of iconic aircraft will be taking to the skies at the annual Large Model Air Show. Taking place on the airfield at Cosford, this famous air show in miniature is an absolute must for all. See Britain's V-Bombers flying together again with the models shown in this video. You can also see the full-size versions in the National Cold War Exhibition! Visitors will be able to see a whole range of models designed, built and flown by members of the Large Model Association from biplanes to modern day jets. From a distance in the skies, the models truly look like the real thing! There's also plenty of refreshments to purchase and new 'Future Pilots', where there is the chance to try flying a small scale model aircraft. PLUS: On Saturday 6 July, weather permitting there will be a flypast from the Battle of Britain Memorial Flight Spitfire and Hurricane. On Sunday 7 July, there will be a flypast from the Battle of Britain Memorial Flight Lancaster, again weather permitting and times will be announced nearer the day. - Some of the kits can take two weeks to assemble, large models such as a VC10 can be up to a staggering seven years! 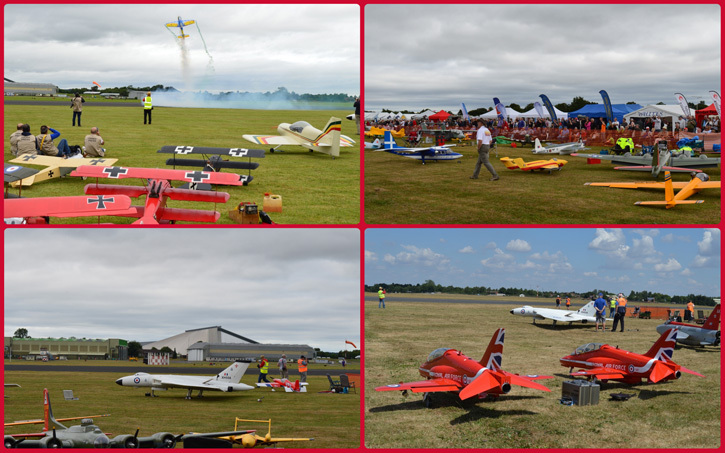 Gates open at 8.30am, the model aircraft start flying around 9.00am and will last all day. A free shuttle bus service will be operating between the Museum and airfield from 10.00am to 5.00pm. If you would like to make a weekend of it, public camping can be booked in advance and prices start from £40.00, please click here to find out more. If you would like to find out more about having a trade stand at the 2019 Cosford Large Model Air Show please email us. This event takes place on the airfield and there is no shade on a hot day, please do not bring dogs unless they are Assistance dogs.